"I love the search functionality"
"RubyMine es fantástico pero un poco lento"
Lo mejor que me gusta es la optimización de código que RubyMine realiza en el código. Viniendo de un fondo no rubio, no estoy acostumbrado al estilo Rubí de codificación. Especialmente el uso de cláusulas como a menos que, si las condiciones. Rubymine no parece tan potente como otros IDE de Jetbrain como PyCharm o IntelliJ. Algunas de las áreas en las que puede haber mejoras son saltar de una parte del código a otras utilizando un atajo de teclado. Después de cierto punto, Rubymine no es capaz de realizar optimizaciones en el código porque es demasiado largo. Si estás comenzando con Ruby, te sugiero que te alejes de RubyMine por un tiempo y hagas las cosas manualmente. Lo uso para completar mis tareas universitarias. Me ahorró mucho tiempo al depurar, ya que Rubymine tiene un potente depurador que me permite ir línea por línea y ver el valor de cada variable. The best thing I like it the code optimization that RubyMine performs on the code. Coming from a non-ruby background, I am not use to Ruby style of coding. Especially the use of clauses like unless, if conditions. Rubymine does not seem as powerful as other Jetbrain IDE's like PyCharm or IntelliJ. Some of the areas where there can be improvements are jumping from one part of the code to other parts using a keyboard shortcut. After a certain point, Rubymine is not able to perform optimizations on code because it is too long. If you are beginning with Ruby I would suggest stay away from RubyMine for a while and do things manually. I use it for completing my university assignments. It saved me a lot of time while debugging as the Rubymine has a powerful debugger allowing me to go line by line and looking at the value of every variable. "one of the best IDE out there"
If you don't want to be meddling with vim settings and you just want to star coding with support for code completion and class navigation there's nothing better than RubyMine. You can go straight to a class or method definition from wherever you are seeing it being used to help you understand it. Now with support for rubocop your code style can improve a lot. In general one of the best IDE you can get for ruby or ruby on rails. ""Best Editor for Ruby on Rails""
I like editors that are quick and lightweight, and was reluctant about regularly attempting an all the more all out IDE when I was so alright with editors like Sublime Text. RubyMine some way or another persuaded me and now I am changed over. I've been utilizing RubyMine for a long time now and the speed it has joined with the majority of the power and alternatives when you need it (and mess free when you don't) make RubyMine my ideal proofreader. As a result of everything going on in the background, RubyMine can be a be somewhat moderate to begin if numerous undertakings need to open immediately with numerous tabs. This is likely something I could fix, by not keeping such a large number of things open, however it is decent to see an enhancement for startup time and CPU utilization. Out it an attempt regardless of whether you are reluctant about utilizing an out and out IDE. It can feel quick and lightweight while as yet giving you some decent additional highlights. The additional highlights that aren't required by everybody likewise have a pleasant method for being available, however not causing mess. Quicker and more dominant for building RoR webapps than any supervisor I have utilized. Worked in variant control make it amazingly quick to submit changes and view history. "Great text editor, one of the best new ones!" It is not as felxible as vim. Also, it feels a little cramped, but that's what you get with an IDE vs text editor. I also think the package manager in sublime is more straightforward than the plugins in RubyMine. The way that RubyMine manages open tabs at the too of the screen is a little annoying - they can scroll left to right. Definitely give it a chance, you will not go back to your previous text editor! Replaced most Ruby text editors in our company. The benefits are that its super easy to use, you can access your db and terminal from within. Excellent error detection. Split panes are nice, elegantly implemented. Has a slick model diagram viewer, tons and tons of features. I love the syntax highlighting in Ruby, the ability to click into symbols, variables, controller definitions etc and the version control features are also very good. So far I've been able to switch from Atom to RubyMine and experience a bit of an uptick in productivity. I attribute this mostly to the fact that the entirety of my team is using the program and is available to answer any questions I may have. If my team wasn't using RubyMine and I went in blind by myself I'm willing to bet my experience would be much worse. "Best Editor for Ruby on Rails"
I like editors that are fast and lightweight, and was hesitant about ever trying a more full blown IDE when I was so comfortable with editors like Sublime Text. RubyMine somehow convinced me and now I am converted. I've been using RubyMine for 2 years now and the speed it has combined with all of the power and options when you want it (and clutter free when you don't) make RubyMine my perfect editor. Because of everything going on behind the scenes, RubyMine can be a be a bit slow to start if many projects have to open at once with many tabs. This is probably something I could fix, by not keeping so many things open, but it would be nice to see an improvement on startup time and CPU usage. Give it a try even if you are hesitant about using a full blown IDE. It can feel fast and lightweight while still giving you some nice extra features. The extra features that aren't needed by everyone also have a nice way of being accessible, but not causing clutter. Faster and more powerful for building RoR webapps than any editor I have used. Built in version control make it extremely fast to commit changes and view history. "One of the best IDE for coding in Ruby"
As well as other Intellij programs I really love the way that they keep the same visual assets as well as the same functionalities. They do it really well with the Go to definition and the find usages options. I use it almost everyday. Well... I dont really like the size of the IDE, it's really heavy and if you're using a Macbook with only 120gb of space, you can't really be wasting space, so I have RubyMine on a separate external hard disk, no big deal at the end of the day but it's a bit annoying to go with the macbook and also the hard drive. RubyMine is a must in your daily programs if you're a Ruby programmer. It makes things a lot easier than other programs like NetBeans or Eclipse. It helps me a lot with the Git control module and the documentation that auto implements to your code, making it a bit more easy to coding on Ruby (Which is really difficult) . sometimes it takes too much time ti give any meaningful response and you are clueless what is going on. RubyMine is good for proof of concept (at least I used it in this way). I didn't have a chance to create production grade project yet. Other team used different approaches to ruby development and I heard that after trying so many tools they finally end up purchasing license for RubyMine as it's easy to integrate with versioning system and there is very few issues in the team collaboration flows. I like that many people already use this IDE and you can easily find help on the industry specific forums or just on the stack over flow. Glad to see developers of the product taking time releasing new versions often in the response to customer feedback and early bug reports. I think product can be used in many situation and feet different needs of the typical software company or organization with significant software presence in their business model. Each team is different, so I can only share opinions that I observed in our company and not sure if there are serious problems on really huge projects. "Have been using for 6 years"
I have been using it for 6 years not just a professional license but I even have purchased a personal license because I do not dislike it. QA automation. I can use many gems, packages and integrate to use various functionality. I can work on projects that are written in JS as well as Python. "Best way to manage and debug ruby/rails code"
The RubyMine team has done a tremendous job of keeping up with the ever changing toolset involved in complex Ruby and Rails projects, and they continue to make coding easier. I've played around with other editors, and one nice thing about Ruby is you don't usually need things to be too fancy, but hands down the best feature of Rubymine for me is the debugging process. I can quickly dig into a problem in my codebase, a new client's codebase, or in a 3rd party gem, and figure out what is really going on at runtime. It saves me so much time, and helps me understand a complex codebase faster. The way the pricing works I sort of feel like I just paid for it, and then I have to pay again, or there is a deal that comes out right after I buy it, and I feel like I overpaid. Try it out and see if it works well for you. If you have an underpowered machine, or a huge codebase, you might run into issues. Quickly understanding a codebase, debugging a complex problem, improving the documentation and cleaning up the code so that other team mates can get up to speed quickly. "Un fantástico IDE para tus proyectos de Ruby on Rails"
Lo que más me gusta de este programa son las opciones de configuración flexible, así como cambiar a la declaración de métodos y variables. Soporta GIT y es muy flexible al ejecutar las pruebas, también proporciona asistencia de código, opciones de refactorización seguras y soporte para JS. Suele usar mucha memoria RAM y a veces es un poco lento. Puede llegar a ser un poco confuso si no estás familiarizado con este programa. Es un buen programa que está bien de precio y te puede ayudar mucho, sobre todo si tienes proyectos de Ruby on Rails. Además puedes probar su prueba gratuita de 30 días para probarlo. He usado RubyMine como un IDE para Ruby on Rails y me ha servido de ayuda para agilizar el desarrollo de mis aplicaciones. "Ruby Mine REVIEW IT Development Software"
I changed from sublime to RubyMine a month prior as I began another activity (they were at that point utilizing it). I have unquestionably not aced it yet, but rather I do truly welcome various highlights. Proviso - this is my first genuine programming work and my first IDE. The venture is a reasonably measured Rails and Precise task with Cucumber, RSpec, and Jasmine tests. I think my most loved piece of having the RubyMine IDE is the test incorporation. I think that its a lot simpler and faster to investigate tests when I can navigate each falling flat test, take a gander at the call stack, and bounce straightforwardly to the record I need with a single tick. At that point I can undoubtedly re-run just the tests that have fizzled without working through the direction line to determine precisely which ones I need running. I also really like the git integration. I can click the "changes" window to get an overview of the files I've changed, and committing and pushing is a breeze. I never did use the GitHub GUI though, so maybe this isn't an improvement over that. RubyMine feels somewhat confined, in any event for me, however that is the thing that you get with an IDE versus content manager. I additionally think the bundle supervisor in grand is more direct than the modules in RubyMine. The manner in which that RubyMine oversees open tabs at the highest point of the screen is a bit of irritating - they can scroll left to right and I am simply not a fan. Sorry for the fairly continuous flow musings. By and large they're both strong choices, yet I'm content with RubyMine for my little to the moderate-sized undertaking. Enterprises have unique needs and requirements and no software solution can be just right in such a scenario. It is futile to try to find a perfect off-the-shelf software system that fulfills all your business wants. The wise thing to do would be to modify the solution for your special needs, staff member skill levels, finances, and other elements. For these reasons, do not rush and pay for well-publicized leading systems. Though these may be widely used, they may not be the best fit for your specific wants. I love the keyboard shortcuts, the debugger, the code navigation, the intellisense! I also really like being able to set up different Run/Debug configurations so that I can run pretty much any scenario I would like via a quick keyboard shortcut. I find the default visual themes to be a bit lacking, and I haven't been able to find any custom themes that make the editor look quite as nice as Sublime or Atom. The editor can also be a resource hog on slower machines and you'll find you might need to restart it once in a while to keep things moving smoothly. Take the time to set things up properly, it'll pay dividends. Also, don't be turned off by the keyboard shortcuts that don't quite map to Sublime or Atom... In time you'll end up preferring them. I'm writing code day in and day out and a fully equipped IDE like RubyMine really makes me more productive. There's just so much more it offers on top of a text editor like Atom or Sublime. The debugging features alone probably make me twice as productive as I was when I just used a text editor. "Awesome product. Great productivity IDE." Everything. IDE has full fledged support for ruby and ruby on rails projects. Database inspector, terminal access, debugger, VCS integrations. Everything is just awesome about this product. Need more themes. Although there is an option to create you own themes and color combinations, but it is not that intuitive and requires a lot of effort. Would be helpful if there are more inbuilt themes packaged with the product. Apart from that, the database inspector could use some love and needs improvement in terms of GUI. RubyMine is full featured, right out of the box, but never gets in your way. The most powerful features I love are the built-in debugger and the interface for dealing with merge conflicts in git. RubyMine's capability to jump to usage or jump to definition is extremely handy as well. Being able to use the built-in test runners right out of the box (rspec and cucumber) is absolutely great, too. I don't like that sometimes RubyMine gets laggy due to its resource-intensive nature. I think that's my only con in the years I have used it. Sometimes I need to close it and let my computer free up RAM. Definitely check out their trial version, there's enough time allowed to see if you really jive with the software. If you end up purchasing, I would absolutely spend time to learn all the ins and outs of the product, and customizing configurations such as hotkeys, shortcuts and interface. I was solving for developer productivity -- I promptly succeeded, and then some. When I use RubyMine, my productivity skyrockets. Debugging complex issues becomes a cakewalk when using the interactive debugger. "The single IDE for ruby"
A lot of functional, beautiful interface. Supports a variety of plug-ins for all purposes. Color themes, git interface terminal, comfortable code navigation, easy access to gem sources and more you will get out of the box. Frequent updates of the IDE, and plug-ins. A minimum of bugs and crashes, all is stable, like clockwork. Pretty large appetite for the PC, in some cases it may boot the system by 100%. Long run for the first time and initiates a project for a while. Not clear settings, you need to spend some time, to find the right option. Major updates need to download and re-installed that a little convenient. Do not forget to import settings from a previous version of the IDE. Nothing. All is simple as never. Thanks to him, you will never get lost in the projects with a lot of code, all calls will be apparent. Will be accustomed you to "beautiful code" and all the good practices of the world Ruby. Highlight all unused variables, methods. Otherwise, say where the code will be interrupted. As there is a debugger that will help you understand what is happening around. "Easiest way to get into ruby infrastructure"
It is possible to get into other gem sources in 1-click, pretty editor with autocomplete, good interface and easy get into hot buttons. It is good tool, which combine pretty git blame history, i forget when I needed to use sourcetree last tile. With Rubymine is really easy gem developing. High memory usage, some built-in automatic , which may confuse sometimes, like automated links changing. Ugly on height resolution monitors (4k). Currently, I do not know how to get list of all errors in the file (may me the is a checker, but I could not find it). Today db connection from rubymine is useless, but I can not turn it off. When I increase left-menu bar font size (where is files tree), file extensions are crop. Rubymine have good style guide check from baatsov, but why you can not inject automatic rubocop file fix up according `rubocop.yml` if it is commited to the project (Of cause Guard may help, but, I think, this functionality will be good addition for Rubymine). In Lunux Ubuntu (lubuntu interface) i have conflict with defaults ctrl+alt+arrow, it will be perfect if it will be default doubled with other combination. Also, i think will be good practice to make autoconfig for git to exclude .idea folders from commits. "Lots of features, but heavy on resources"
I think RubyMine is a great tool if you want to be able to do all of your work in one place. You can code, add in breakpoints, debug, execute tests, etc all from one place. If you want to centralize your workflow, RubyMine is a great option. I tend not to use most of the features in the IDE. I like to write my code in it, but I usually end up using the terminal on my Mac anyway; and for debugging, I just use pry from the command line. Good tools available, but when you don't really use them, you end up with something very heavy on resources without much added benefit. Do you need such a comprehensive feature set? Then this is a great tool. If you value your resources over convenience, maybe not. One thing that has been helpful with RubyMine is giving everyone, even those who are new to dev work, the ability to efficiently code and debug. If this is your first rodeo, there are so many great features for running tests with one click, stepping through code, and so on. Fully integrated Ruby IDE: with code completion, smart code analysis, refactoring, code navigation, test runner, debugger, great Git client, great database client. It's just so much faster to develop Ruby/Rails projects than anything else. Very healthy plugins system. If you like to use Vim - you can use Vim inside of RubyMine, just install a plugin. It tends to use a lot of CPU and memory, which is only a problem if I'm trying to work off my battery. Working plugged in - I barely feel it. IdeaVim plugin isn't ideal: some Vim features don't work, dialogs cannot be closed with ESC key. All minor - so not a big deal. I understand that Vim or Sublime a "cool", but they are simple text editors. Save yourself some time by switching to RubyMine: productive is way cooler than just "cool". It simply saves a TON of time: debugger alone is worth it - when compared to console debugger. "Sin duda el mejor IDE para Ruby"
RubyMine es un excelente IDE para los desarrolladores de Ruby on Rails, los accesos directos son excelentes, puedes conectar tu base de datos y construir tus proyectos localmente, su autocompletado es muy útil. Además tiene un gran número de complementos y tiene un diseño moderno. Muy pocas veces el programa se queda helado y tengo que cerrarlo y volverlo a abrir pero bueno, ningún programa es perfecto, dejando eso de lado, no le he encontrado más inconvenientes. Lo recomiendo sin duda si desarrollas en Ruby on Rails, puedes probarlo gratis así que aprovéchalo. Gracias a RubyMine he creado proyectos para Ruby on Rails eficazmente y me he ahorrado mucho tiempo gracias a su autocompletado y sus múltiples funciones. "Best Ruby IDE out there"
I love the UI of this software. It's fast and also elegant at the same time. There are many, many, MANY different options to configure the UI and layout to your liking for maximum readability. I also like that RubyMine is smart enough to automatically sense when you're opening a Git project, or an RVM/rbenv directory and applies the needed settings. I dislike that Rubymine, and the reset of Jetbrains software has moved to the subscription-based licensing model...but I guess that is just the trend nowadays. I also dislike the amount of resources that this IDE consumes. Yes, it looks nice and works GREAT but it will eat your CPU cycles (and your battery) like no tomorrow. Everyone has their own personal preferences when it comes to IDE, but if you're considering a new one then DEFINITELY give Rubymine a try. It gives numerous options for adjusting the UI to the user's liking, has a plethora of built-in features for better understanding and re-factoring code, and the IDE itself is fairly smart when it comes to opening/importing projects from version control (Git). Using RubyMine, I'm able to better collaborate with other teams by importing their projects and using looking up said team's methods within seconds. This has shaved tons of "ramp up" time off of joining new projects. "If you code in Ruby, use this IDE!" This IDE makes coding in Ruby easy and intuitive. The auto completion is a great feature, as well as the click to track. Find usages is another great tool. The GitHub integration is also quite useful, with in line annotation, as well as commit comparison. RubyMine also makes running tests easy, and navigating through multiple projects a breeze. The IDE is heavy, no doubt. At times it can be slow if you have a high uptime, or just have a slow computer. Depending on how big your project is, it may be slow as well. Getting RM set up could be a hassle too, I did have a few hiccups trying to get my environment variables all settled in. 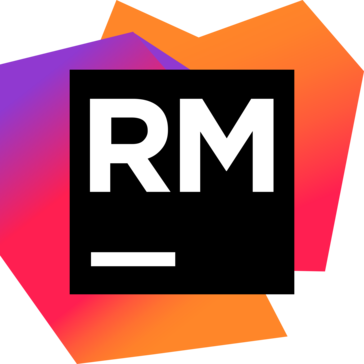 If you use Ruby on Rails, use RM! When coding a large Rails app that has many sub-apps even, a tool like RM is necessary to maintain a fast and efficient workflow. It has made my life a lot easier, that's for sure. "Great IDE for Ruby developers"
It makes navigating the codebase extremely easy. It can feel laggy when it is running multiple tests in the background via linters It can feel laggy when it is running multiple tests in the background via lintersIt can feel laggy when it is running multiple tests in the background via lintersRubyMine's ability to let you click into deeper view files is really efficient when developing in big applications. The vast array of developer options to utilize in preferences is also a great addition. RubyMine's ability to let you click into deeper view files is really efficient when developing in big applications. The vast array of developer options to utilize in preferences is also a great addition. RubyMine's ability to let you click into deeper view files is really efficient when developing in big applications. The vast array of developer options to utilize in preferences is also a great addition. RubyMine's ability to let you click into deeper view files is really efficient when developing in big applications. The vast array of developer options to utilize in preferences is also a great addition. RubyMine's ability to let you click into deeper view files is really efficient when developing in big applications. The vast array of developer options to utilize in preferences is also a great addition. Spend some time really familiarizing yourself with the tools and additional plugins RubyMine offers you - it will increase your productivity ten fold and will become second nature. I can work a lot faster with RubyMine to source files It can feel laggy when it is running multiple tests in the background via lintersIt can feel laggy when it is running multiple tests in the background via lintersIt can feel laggy when it is running multiple tests in the background via lintersRubyMine's ability to let you click into deeper view files is really efficient when developing in big applications. The vast array of developer options to utilize in preferences is also a great addition. RubyMine's ability to let you click into deeper view files is really efficient when developing in big applications. The vast array of developer options to utilize in preferences is also a great addition. RubyMine's ability to let you click into deeper view files is really efficient when developing in big applications. The vast array of developer options to utilize in preferences is also a great addition. RubyMine's ability to let you click into deeper view files is really efficient when developing in big applications. The vast array of developer options to utilize in preferences is also a great addition. RubyMine's ability to let you click into deeper view files is really efficient when developing in big applications. The vast array of developer options to utilize in preferences is also a great addition. RubyMine's ability to let you click into deeper view files is really efficient when developing in big applications. The vast array of developer options to utilize in preferences is also a great addition. RubyMine's ability to let you click into deeper view files is really efficient when developing in big applications. The vast array of developer options to utilize in preferences is also a great addition. RubyMine's ability to let you click into deeper view files is really efficient when developing in big applications. The vast array of developer options to utilize in preferences is also a great addition. "RubyMine - the popular IDE"
The RubyMine Git Annotate command makes it really easy to see who was the last person on your team to write or change that function. When you’re working on a large team project, there are often times when you’re not sure why somebody wrote a function the way they did or why the function is even there! There are problems with RubyMine not paying attention to the remapping when using keyboard shortcuts. I've been told that this is because of a shortcoming in Java, but that might be wrong. Some devs like something "ready to use out of the box". Some devs like to have they're own setup and fiddle around and have that raw power that something like Vim and Emacs gives you. So i guess you're just working or you've only encounter the later type of devs. I build scalable high-volume applications for a digital-health monitoring company. If you’re on a spec file, simply click and RubyMine will run the tests from that spec file right in RubyMine. You can then easily look at the red tests and click on the problem lines right inside RubyMine, without having to look at the terminal and figure it out. One goal of testing is to make the RED => GREEN => REFACTOR cycle as efficient as possible, and RubyMine definitely speeds up the process. "A heavyweight IDE, however best IDE for Ruby developers"
If you have a decent pc with 8GB RAM than I will recommend you to use RubyMine as your first IDE for Ruby/Rails development. "Easy to use Ruby Interface"
I like how simple and effective it is to use. I am currently learning how to program in Ruby and this has helped me be able to pick up the language pretty quickly. I also really like how the coding hints really help point in the right direction of what I need to change with my code. This has been extremely helpful in learning the basics. I think the thing I dislike the most is if you are trying to switch between tabs you have to double click to switch over instead of single click. I keep getting tripped up by this. "Great IDE for Rails Development"
Great tool for traversing your codebase. The shortcuts are great as well as the ability to give more productivity to a junior developer in a shorter amount of time. You can connect your database and build your queries locally which is helpful for testing one offs. Setting up your config file is easy to make sure that your code is easy which allows everyone on the team to be on the same page. The newest version has become laggy and can bog your machine up a bit. Not sure why with the current iteration. I think that it is worth the yearly investment. Productive professional and hobby web development. Rubymine really allows me to be productive. "Seriously, why use anything else?" Rubymine does everything you could ever need and more. Amazingly functional auto-complete, great generators, excellent linting support, addons, great layout. Everything is, in my experience, just about perfect. Doesn't eat up your system resources either! I thought long and hard about this and honestly cannot think of a single thing that I genuinely dislike. Integrating the menagerie of tools that one might use to develop a Ruby app into one is a godsend. I usually like Jetbrain's editor and hence found most of the features similar to that in most other Jetbrain's editors. These common features were good but I didn't find any Ruby specific features to be good. The auto-correct was not that good as other editors. Also, cmd+click usually takes me to the declaration or usage of a variable but in Ruby-mine things didn't use to happen normally. Most of the cmd+clicks just failed I have no idea why. "Most powerful Ruby IDE on the market." It's the heaviest, most feature-complete editor for Ruby available. Out of the box. Period. Quick project navigation, incredible refactoring tools, incredible testing support, native support for Ruby-related tech, etc. Nothing else comes close. I've been a paying customer for over four years now, and I've use it pretty much every working day.since I started with Ruby. It's been a blast. it's a Java app, and requires a pretty beefy system to run it well, especially if you're working with a large codebase. I work on a top-tier Macbook Pro, and it never feels fast. Sometimes, it even gets dead slow, and it can get frustrating. Indexing always takes a lot of time, and even simple things like navigating to another file by searching (double-shift shortcut) can be painfully non-responsive, taking whole seconds to find the queried file. In contrast, an editor like ATOM is lightning-fast, and it's difficult to recommend Rubymine because the performance / speed situation is hard to ignore, when you're paying a hefty sum of money to use the software. Try it out. The refactoring tools are absolutely magical. My jaw dropped to the floor the first time I saw it in action - Juggling methods and classes around like it was nothing. However, note that you need a good system to let it breathe, and some patience when it inevitably slows down every now and then. On the whole, it saves time. A lot of it, that would otherwise be spent switching contexts to do related tasks. Want to boot up the development Rails server? One key combo plus enter. Want to checkout the contents of the database? Use the inbuilt GUI. Want to see the history of the file you're working on, and who's to blame for that awfully fat method? Use built-in Git annotate feature. Want to run your tests? Another key combo, pops up a built-in test runner and code navigator. It's got everything. "One of the best IDEs"
Almost everything! The refactoring is good. Love the dracula theme. Finding a file or a text is super easy. Good integration with the VCS. It crashes sometimes. Multiple cursor selection adds an additional cursor on the first line which gets a bit annoying. Do not think before getting this product! Developing a RoR web app. Used rubymine to reformat the complete application. Using rubymine's VCS rather than the shell. "Extremely helpful for keeping track of large projects"
There are so many shortcuts and tools to boost productivity when using RubyMine, especially when dealing with massive projects that would otherwise be a pain to keep mentally organized. There are a ton of powerful refactoring tools, an extremely robust search, and a whole host of configurations so you don't have to think about any minutia you'll never really change anyways. Every so often, an update will either change some configuration or make some shortcuts not work anymore. Definitely check the changelog before updating. If you really get to know the shortcuts and generators it provides, it can really speed up how quickly you code. "A very convenient IDE for Ruby users"
Similarity and compatibility with other IDEs (like PyCharm, Eclipse etc) - hence easiness to switch between platforms and languages. Slow in Windows 7, when loading, many updates run in the background, and it's not clearly indicated what the updates are and how long it'll take. Not the best help and in-line prompt. Use operation system no less than Windows 10. If you know any other IDE like PyCharm, the switch will take no time. QA and website construction and editing. "Rubymine : Feel Awesome in Heaven"
Ever wonder a partner to help you in Ruby on Rails development. Just choose Ruby Mine and be amazed. It will help you out at every single step where you need it. Better to stay within Ruby mind and use the terminal also database also tests and a lot other bundled all together. Rapid Software Development I need and RubyMine assists me in it very well. "Using RubyMine IDE to write ruby code"
I love the UI. It is very easy to use. It is very well integrated with other plugins like git. It also has a terminal which is easy to use. Lot of different themes. Custom themes can also be added. The shortcuts are hard to learn in the beginning and the shortcuts are not the same as other Intellij products. It is definitely one of the best Ruby IDEs out there. There is a steep learning curve. But once we are used to the UI and the shortcuts, it is definitely very easy to use. But the IDE shortcuts are not consistent with other Intellij IDEs. It is very fast and it has lot of plugins to read other programming languages code also. Creating ruby projects. Integrating with maven so we can build the projects. Create ruby modules. "Sublime text on steroids = RubyMine"
The internal debugger helps us catch bugs easier than ever. Code completion and project navigation helps us move through the source files in a fast and efficient way. It can be CPU and memory intensive sometimes. This can lead to a slow experience. Sometimes with a restart of RubyMine it works just fine. If your project has hundred of files and complex code, Rubymine can help you a lot and simplify your daily work 2X. It helps us code faster, refactor the code in a much easier way and test . The biggest benefit we perceive by using it is how fast we can navigate hundreds of source code files and take advantage of the builtin debugger. "Like RubyMine because of usebility. A lot of common sence in Editor. " most of all I like the flexible setup options, as well as switching to the declaration of methods and variables. 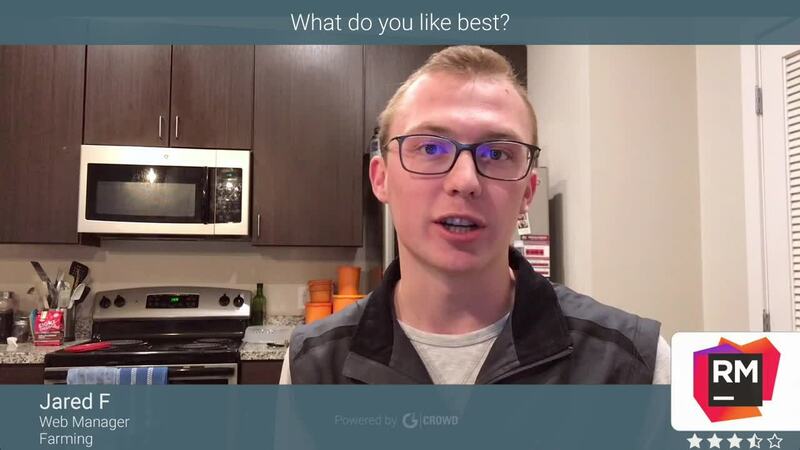 I know that for free tools you can spend hours to do what they want and you also spend a lot of hours to understand how they work and how you can improve them. With RubyMine someone else spends the time to thing about those things. RubyMine native debbuger is really slow, and I have to use terminal. The code completion is very aggressive and often guesses wrong. Web Automation. A lot of Ruby on Rails and Ruby developers use RubyMine. It's a very good IDE that has a lot of useful functionality. Considering Ruby as a scripting language it has the best support for navigation, ruby syntax checking and support. Also git and svn support and plus deployment through ruby mine. Flexibility of running test cases auto suggest. Sometimes it hangs, but rarely happens. It is actually really great of ruby beginners. Foe beginners it is really a must IDE. Exploring it in deep will really help you understand how it functions and benefits of using it frequently. "Good tool for Ruby Developers/Engineers"
I have used the IDE for about 2 years and I think it is a great tool. It gives code assistance, smart for debugging, safe refactoring options, support for JS. You can also try it for free in order to check it out. It works great with source control systems such as GIT and you do not need to learn anything about git. you can also use the console from rubymine which works great. If you want to refactor more files, you can preview it as well which all files are going to be changed. I do not enjoy the themes on ruby mine. It is heavyweight and needs good RAM capacity in order to work well. They also need to build out some more themes to make it more interesting. Do use the 30 days trial version. It is a great tool for the new web developer who has not yet used any tool before. Spend time in using the shortcuts it is very helpful. I like the use of shortcuts and makes things faster. I think it works great if anyone needs an IDE for the Web development and want to expand their horizons. Debugging is very easy and it has helped me to debug my unit tests as it was a cakewalk. "Very good and heavy IDE"
Intellisense when you type function, UI panels which can you love using your mouse, lots of plugins and mamy editor features such as find and replace, find definition and file indexing. User can also mark folders using incons and using builtin git plugin push and view repo changes. I can also run it on linux, mac os and Windows. "The best Ruby IDE out there"
It doesn't work extremely well with resolving references in code, specially when there are multiple implementations of an interface. It often resolves incorrect references with rspec let blocks. It is the best Ruby IDE out there. Other options are using editors like Sublime or Vim, which are great but I wouldnt consider as IDEs. "Great tool for Ruby development"
"Powerful IDE with all the extras included"
Provides a one stop shop for all the best Ruby and RoR development tools. JetBrains has done a great job of bring the same power and ease of IntelliJ into the Ruby world without overwhelming the user. Can be resource hungry. Great for full development but overkill when scripting or making minor tweaks. Great tool for beginners through exports. Provides a standardised development environment across the department. I love that RubyMine is so easy to use, has the terminal and console right in front of me so that I can code efficiently. Also, the search functions help me find everything I need! It can be overwhelming and maybe a bit too much for a newbie, but you can definitely grow into it! Since everything is streamlined, we write higher quality and testable code! The best part of RubyMine are the refactor options. If you ever find yourself renaming a method you definitely don't want to look for each usage. RubyMine looks for all usages of that one renamed method within the entire project and offers you to replace it. If you're unsure RubyMine can take you step by step through all the files where your method is used. So far there are no dislikes except the speed of booting RubyMine up. If its booted up you're good to go. What I noticed is that if there are any bugs in a RubyMine version, the developers are fast with rolling out a patch to fix bugs. If you're using a light weight code editor at the moment, you should try RubyMine for a while and you will start to love it. RubyMine saves you and your company a lot of time by making you very intelligent suggestions as showing you all the usages of a method that you are renaming. Furthermore there are tons of features included (Database management, UML diagrams). All in all you have one place with everything in that you need. I love that it's an IDE and the ability to CMD+click to look at method definitions is by far the most useful feature. I also like that it pinpoints the file you're looking at in the project directory as well as can shelve changes you're working on and create patches for you. "Very helpful editor for ruby development"
I like this editor because i can easily use the rbenv ruby versions without additional configuration and simple to use. "RubyMine is the best IDE i use for ruby stuff"
i love the debugging and finding methods for all those libraries, able to run internal web server within the iDE. really amazing. someone crashes when running web server inside the IDE. have to restart again. it is the best IDE in town for Ruby development. i use rubymine to write ruby on rails code. easy to build web sites. * We monitor all RubyMine reviews to prevent fraudulent reviews and keep review quality high. We do not post reviews by company employees or direct competitors. Validated reviews require the user to submit a screenshot of the product containing their user ID, in order to verify a user is an actual user of the product. Hi there! Are you looking to implement a solution like RubyMine?